This week, 4U Management clients Jason Allred and Martin Ureta play in the first round of the PGA QSchool. Jason will participate in Valdosta, GA and Martin will play in Pinehurst, NC. Caracas, Venezuela – Chile, Venezuela and Brazil secured their place among the 28 nations expected to compete in the Omega Mission Hills World Cup next November in China. The Chileans, who led for the entire week, and the Venezuelans, a solid second since day two, earned their spots comfortably. Meanwhile, the Brazilians claimed the last spot available by defeating Guatemala in a dramatic playoff hole. Chile’s Martin Ureta and Hugo Leon, both 24, played as the most seasoned veterans this week at the Caracas Country Club. 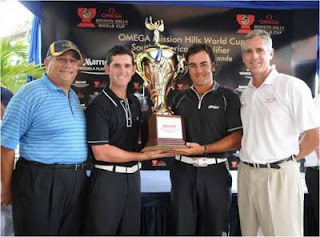 Their aggregate of 27-under par 257 set a record for the Omega Mission Hills World Cup South American Qualifier Copa Marriott Venezuela Playa Grande, at least for the eight years the event has been conducted by the Tour de las Americas on behalf of the International Federation of PGA Tours. “It’s really a huge honour to have the opportunity to represent Chile in the World Cup. This was our first time representing our nation as professional players, so it has been a great start. Martin (Ureta) is one of my closest friends, so it’s an honour as well to have the opportunity to share this experience with him,” said Leon after a conservative even-par 70 final round of alternate-shot foursomes that awarded them a three-stroke victory. 4U Management has 4 clients competing for their 2010 PGA TOUR card beginning this Wednesday. Mark Harrell will tee off in Florence, SC and Zack Sucher will be in Auburn for the first stage. 4U Management client, Ben Crane finished T19 at the Justin Timberlake Shriners Hospital for Children Open yesterday, earning $50,904 and putting Ben at number 52 on the PGA TOUR money list. Lee Janzen will participate in another food drop for Feed The Children on Oct 27 at the Jackson Revival Center Church in Jackson, Mississippi. Janzen has helped with several food drops across the country and encourages others to get involved in this worthwhile cause. One of the most decorated golfers in school history ... listed as No. 8 on the Top-10 Dominators of the Year among the collegiate and professional ranks in 2007-08 by SI.com ... ranked as the world's No. 6 amateur golfer at the beginning of the 2008-09 season by Golfweek Magazine ... a two-time All-American who was named to the U.S. team for the U.S.-Japan International Cup...Zack Sucher signed with 4U Management as he embarks on his professional career. "We are fortunate to have the opportunity to work with Zack and look forward to an exciting future together," said Tommy Limbaugh, Founder and President of 4U Management.